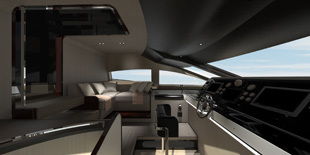 Spring 2014 will see the launch of a brand new Grande model from Azimut, the Grande 95 RPH. RPH stands for Raised Pilot House and this is what gives the 95 its unique looks and on board workings. The Stefano Righini design stands out for both its intricate, swooping superstructure and the shear amount of glass involved. SEE MORE PICTURES OF THE AZIMUT GRANDE 95RPH ON OUR FACEBOOK PAGE. The raised wheelhouse that is so crucial to the 95’s character means that the helm is totally separate from the living space on the main deck. A spiral stair case leads up to the wheelhouse where you have the main bridge and also a small seating area for crew to keep the skipper company. 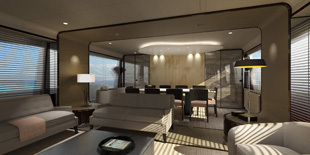 With the bridge out of the way the master suite can take pride of place in the forward section of the main deck. This enormous cabin includes a marble-clad bathroom and floor-to-ceiling glazing, giving the owner spectacular, unencumbered views of their surroundings. Guests are catered for in four ensuite cabins on the lower deck whilst the crew quarters, large enough for four crew members, includes three separate cabins and two bathrooms plus direct access to the galley on the deck above. The outdoor spaces are suitably splendid, especially the flybridge where you get a breakfast bar, large dinette and a hot tub plus spare space aft to do what you want with. The all new hull is a planing design with a skeg and this, says Azimut, makes for greater directional stability. The top speed is an impressive 26.5 knots but slow down a touch and, thanks to 12,000 litres of fuel on board, you could go a very long way indeed. Azimut has also cunningly managed to get the 95 to fall within the 24m cut off so this baby superyacht can actually be registered as a pleasure craft, meaning you don’t need a commerial license to take the helm. So no excuses, what’s stopping you?